In places like Indio, air conditioning is an indisputable necessity. A life with no indoor A/C would be like not having water piped in from wells around the Coachella Valley We would have to get very, very creative about keeping cool and hydrated. Fortunately, we live in a place where these amenities are a given – thank goodness. And though we’re spared the awful humidity common in the midwest and southern states, Californians experience some pretty brutal temperatures. So, let’s celebrate the machines that allow us to live indoors comfortable despite the weather. 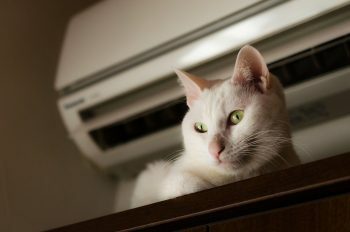 Here are five of the most interesting facts we know about air conditioners. In 1902, Willis Carrier (maybe you’ve heard of his invention??) wanted to find a way to control indoor humidity. He worked at a printing company and needed to find a way to hasten the drying process of the ink on all recently printed material. The moist air was ruining multicolor posters, so Carrier designed a chilled coil system that produced large amounts of cool, dry air. This invention paved the way to provide enough cool air to make air travel, sleep, work, and play significantly more comfortable. It’s true. Because air conditioners have filters and constantly circulating air, they naturally pull dust and allergens through and trap them in the filter. Regularly changing the filter helps to avoid overworking the system. It also helps to keep indoor air clean and free of allergy-triggering contaminants. The first air conditioners were marketed according to their ability to mimic how many blocks of ice it would take to cool the same space. Nowadays, we refer to “ice power” as AC units. Some of the first climate-controlled rooms were movie theaters. So, during the summer, people were motivated to see movies not so much by interest in the film itself, but by the appeal of cooler conditions. Though it seems rudimentary, some of the world’s largest companies are using large ice blocks to cool their office buildings. And, to offer some perspective, some of those buildings are as nearly 2 million square feet. The system works by freezing water overnight when energy costs and temperatures are low. Then, during the day, fans blow across the surface of the ice blocks, melting them back into water which is then stored in tanks throughout the building. The water is then frozen once again overnight and the cycle continues. This environmentally-conscious system has the advantage of a lower potential for failure but is prohibitively expensive for a single household. It also takes up a lot of space in comparison to traditional central or mini-split systems. 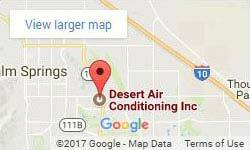 Our knowledgeable A/C technicians know a lot about heating and cooling in Indio. Call Desert Air Conditioning Inc today to find out how to stay comfortable and increase efficiency year-round.